Whether it’s a new mini excavator, dozer, or skid steer loader, you can count on us to help you find the best equipment solutions for your business. That’s the Hawthorne Cat Difference. Hawthorne Cat, the exclusive Cat® equipment dealer in San Diego, the Hawaiian Islands and the Pacific Region, announces a new BCP national offer. 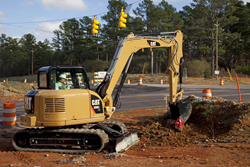 Purchase a new Cat mini excavator and get up to $3,500 cash back. The offer also includes 1.9% financing for 60 months and a powertrain equipment protection plan. Qualifying models include 300.9 – 308CRSB mini excavators. Additional cash back rewards are available for other models and machine families. Offer valid through June 30, 2017. Choose Cat mini excavators for optimum performance and versatility. Their small size makes them easily transportable and allows them to work both indoors and outdoors. Despite the compact design, each model features a spacious cab for maximum operator comfort. Popular models include the 303.5E2, 305.5E2, and 308E2.